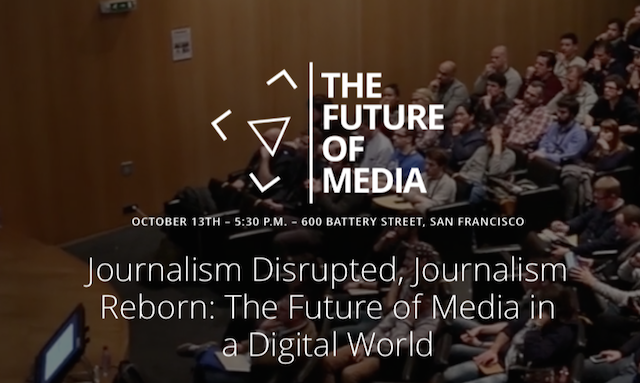 The San Francisco office of PR firm Weber Shandwick is hosting an interesting panel on October 13 with top journalists and corporate media execs titled: Journalism Disrupted, Journalism Reborn: The Future of Media in a Digital World. Weber scores marks for a female-dominated panel with four of the five panelists: Connie Guglielmo, Editor in Chief at CNET News; MC Wellons, SF Bureau Chief for CNBC; Ann Grimes, Professor at Stanford University and a former Wall Street Journal SF Bureau Chief; Caroline Fairchild, New Economy Editor at LinkedIn; and Joaquin Alvarado, CEO for The Center for Investigative Reporting. Weber Shandwick has an active interest in the subject of journalism disrupted as do many PR firms because there’s plenty of new business opportunities. As the number of journalists continues to shrink, PR firms are offering businesses a wide range of editorial media services that includes: creating and publishing online magazines; writing articles, columns and features; creating video news reports; etc. Also known as “content marketing” it’s an attempt to try to plug the gaps in media coverage of companies that journalists once provided. It’s become a huge market. The subject of media disruption has been of constant interest to me ever since I left the Financial Times in mid-2004 and became an online publisher. I warned that the media industry was headed for a severe fall as it transitioned to a digital business because online ad revenues would be a fraction of print revenues. I saw that every company would have to become a media company to some degree, to help tell their own stories. And that’s what has happened over the past ten years as and now “Every company is a media company” is now a well understood concept and it's fueling an explosion of demand for “Content Marketing” — a poor term for what is better described as "Editorial Content" to distinguish it from marketing and PR content. I’ve worked on editorial content strategies with giant companies such as Intel, which has several high quality media projects, most notably Intel IQ and Intel Free Press. It publishes a lot of high quality editorial content that emulates independent magazines. Every company is a media company. However, many companies misunderstand what that means. It doesn’t mean writing endless stories about yourself. Media companies provide a service. The Financial Times and Wall Street Journal provide a financial news service and rarely write about themselves. Corporations need to find a media service they can provide to their target community. It is fine to publish content about yourself but that’s called marketing or PR. My definition for “Editorial Content” is that it doesn’t look like marketing or PR content but provides a service to others — it is Media as a Service (MaaS). Content that is self-serving is called marketing or PR, which is fine and necessary but companies already have plenty of that type of content. Editorial content is different. It is hard to do well. I was hoping Weber would share some of the lessons it has learned from its Mediaco projects but maybe that’ll be the topic for the next event. - Editorial content often turns out looking like marketing or PR — even when former newspaper reporters are hired. This is often because they are led by a marketing or PR boss. Their new boss should be like their old boss. - Company organizational structure has to change. Editorial must be an independent department in the same way as HR, Finance, Engineering, Marketing, and PR are collaborative but independent groups with their own agendas. - Corporate media can produce high quality editorial content. It can be better than that produced by independent media organizations. - Editorial content is journalistic in its look and feel and should offer a service to its target audience. It could be a calendar of events regularly updated; it can be interviews with key industry people not directly associated with the company; it can be a media service that fills a gap in news coverage that independent media once produced; , etc. Editorial content succeeds when it is Media as a Service (MaaS). The best media is MaaS Media! I’d love to hear from a panel of people working to create editorial media projects within large corporations such as Ken Kaplan and colleagues at Intel, and similar pioneers at Cisco Systems and other places. These are the people on the front lines in trying to create a new form of corporate media and a future for journalism. How does a company create an effective editorial work process? It is not the same way PR or marketing is produced. Should you hire former journalists or use PR professionals to produce editorial content? Can corporate media can fill the void? How does corporate media create trust? Are PR firms able to play both the role of promoter and press? How will journalism be reborn? What will be the new business model? We are well into the third decade of the web yet we still don't have a media business model to ensure a thriving, competitive, and independent media industry. Current models are failing fast: Advertising can’t produce enough revenues and paywalls work for small specialist publications but they cut off the Internet’s best publishing feature, one that every media company wants: instant and massive content distribution networks. There are a million questions about the future of journalism and corporations’ abilities to succeed in this role. I’ve been working on, and thinking hard about this topic of the future of journalism, for many years. Our failure to develop new ways to support professional journalists is truly an epic fail. A thriving independent press is hugely important for a healthy democracy and for a healthy industry sector. Innovation in media business models is sorely needed. I may have some answers that I’ll be able to share soon… Stay tuned!